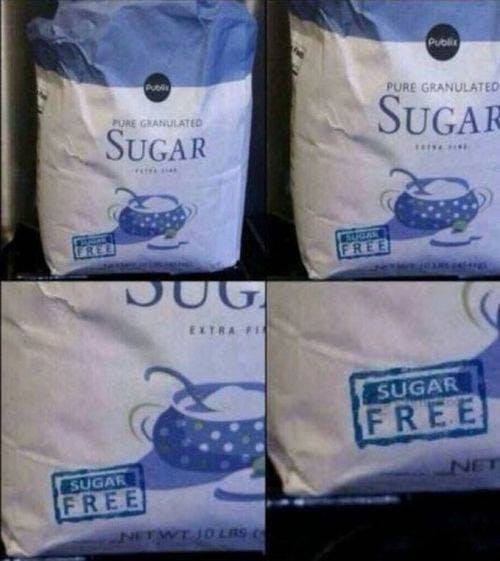 Is This a Real Bag of Sugar? I was sent this picture, which has been turning up everywhere online. Do you think it’s real? UPDATE: The picture is a fake. This, however, is apparently real. When there’s “no sugar added” juice – containing water and sugar – nothing should surprise us, right? Considering there is still a stock photography watermark on the "stamp" I would say, no - it isn't real. The bag of sugar is real - the stamp isn't. "No Sugar Added" is factual, they didnt add any sugar to the juice. But Sugar free sugar? confusing. I shop at Publix and I have bought that exact bag of sugar and it does not say "sugar free" on it! This picture hashows not been doctored and I can say that on account that 1. Its literally my occupation to deal with photography photoshop and doctored photos. 2. I have been to Walmart and literally seen this sugar before. Lastly, don't believe me? Look at the top right corner of the "sugar free" blue box, if that were an added label overlaying the original picture, the blue shadow of the sugar bowl picture would not be there. .
Alex.. while you might work in the photo altering industry. I can tell you likely did not buy a Publix brand bag of sugar at Walmart.. since Publix is its own grocery chair.. and currently feuding with Walmart. I highly doubt Walmart buys from them. now the two stores might buy from a third party that puts Publix on one bag and Walmart on another... though.. what more than likely happened is the wrong label got put on a batch of sugar and it is, in fact, a real bag, just a mistake. Alex D I have work in an industry that uses ink and printing, and I can say that 100% you can! Get the shadow effect like on the bag, I am not however saying the picture is real, but I am saying is that you are incorrect in your statement. Wow. Nice attitude Alex D. Beginning the year with angry rants? Awww. Eat some bacon, or full fat cheese, and butter. It'll cheer you up. Smile. Alex, do you see a lot of other Publix grocery store products at Walmart too? Wow ... This guy .-. Named Alex D ... I have the same name ... Ish ... My name is Alex D (something) it's weird .-. It isn’t real... if you look closely at the “stamp” you can see the faint Shutterstock watermark on it lol!